Presented 10:30 AM – 12:00 PM., November 28, 2016. 172nd ASA Meeting, Honolulu, U.S.A. There are a variety of fire extinguishers available on the market with differing extinguishing methods, including powder-dispersers, fluid-dispersers, gas-dispersers and water-dispersers. There has been little advancement in the technology of fire extinguishers in the past 50 years. Yet, issues may arise when using any of these types of extinguishers during an emergency that hinder its smooth implementation. For example, powder, fluid, or gas can solidify and become stuck inside of containers; or batteries can discharge due to neglected management. This leaves a need for developing a new kind of fire extinguisher that will operated reliably at the beginning stage of fire without risk of faulting. The answer may be the sound fire extinguisher. The sound fire extinguisher has been in development since the DAPRA, Defense Advanced Research Projects Agency of the United States, publicized the result of its project in 2012, suggesting that a fire can be put out by surrounding it with two large sound speakers. Speakers were enormously large in size then because they needed to create enough sound power to extinguish fire. As a follow-up, in 2015 American graduate students introduced a portable sound extinguisher and demonstrated it with a video posted on YouTube. But it still required heavy equipment, weighing 9 kilograms, was relatively weak in power and had long cables. 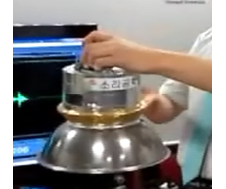 In August of 2015, we, the Sori Sound Engineering Research Institute (SSERI), introduced an improved device, a sound extinguisher using a sound lens in a speaker to produce more focused power of sound, roughly 10 times stronger in its power than the device presented in the YouTube video. Our device still exhibited problems, such as its heavy weight over 2.5 kilograms, and its obligatory vicinity to the flame. Here we introduces a further improved sound extinguisher in order to increase the efficiency rate of the device by utilizing the sound-wind. As illustrated in Figures 1 and 2 below, the sound fire extinguishers do not use any water or chemical fluids as do conventional extinguishers, only emitting sound. When the sound extinguisher produces low frequency sound of 100 Hz, its vibration energy touches the flame, scatters its membrane, and blocks the influx of oxygen and subdues the flame. 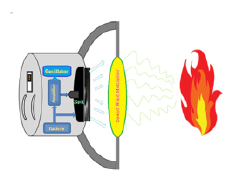 The first version of the extinguisher, where a sound lens in a speaker produced roughly 10 times more power with focusing, introduced by the research team of SSERI is shown in Figure 1. It was relatively light, weighing only 2.5 kilograms and 1/3 the weight of previous ones, and thus could be carried around with one hand without any connecting cables. It was also small in size measuring 40 centimeters (a little more than 1 feet) in length. With an easy on-off switch, it is trivial to operate up to 1 or 2 meters (about 1 yard) distance from the flame. It can be continuously used for one hour when fully charged. The further improved version of the sound fire extinguisher is shown in Figure 2. The most important improvement to be found in our new fire extinguisher is the utilization of wind. As we blow out candles using the air from our mouth, similarly the fire can be put out by wind if its speed is over 5 meters/second when it reaches the flame. In order to acquire the power and speed required to put out the fire, we developed a way to increase the speed of wind by using low-powered speakers: a method of magnifying the power of sound wind. Figure 1. The first sound fire extinguisher by SSERI: the mop type. Wind generally creates white noise, but we covered wind with particular sound frequencies. When wind acquires certain sound frequency, namely, its resonance frequency, its amplitude magnifies it and creates a larger sound-wind. Figure 3 below illustrates the mechanism of a fire extinguisher with sound-wind amplifier. A speaker produces the low frequency sound (100 Hz and below) and creates sound-wind, resonates it by utilizing the horn-effect to magnify and produce 15 times more power. The magnified sound-wind touches the flame and instantly put out the fire. In summary, with these improvements, the sound-wind extinguisher is fit best for the beginning stage of a fire. It can be used at home, at work, on board in aircrafts, vessels, and cars. In the future, we will continue efforts to further improve the functions of the sound-wind fire extinguisher so that it can be available for a popular use. Park, S.Y., Yeo, K.S., Bae, M.J. “On a Detection of Optimal Frequency for Candle Fire-extinguishing,” ASK, Proceedings of 2015 Fall Conference of ASK, Vol. 34, No. 2(s), pp. 32, No. 13, Nov. 2015. 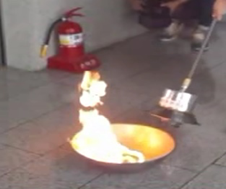 Ik-Soo Ahn, Hyung-Woo Park, Seong-Geon Bae, Myung-Jin Bae,“ A Study on a sound fire extinguisher using special sound lens,” Acoustical Society of America, Journal of ASA, Vol.139, No.4, pp.2077, April 2016.